In this article, Ali Sargent, who used to volunteer for London Mining Network, provides an update on London-listed Antofagasta‘s activities in Chile. London Mining Network has supported opponents of the company’s activities at Caimanes. This article was first published in the January 2014 issue of Mining People and the Environment. In recent months, Chilean copper producer Antofagasta plc has backtracked on plans to double production through its subsidiary company Minera Los Pelambres SA. The move has largely been attributed to rising production costs. Instead the company will now focus on “marginal” expansion. Using current infrastructure, it now plans to increase production by 10-15%. Antofagasta is faced with a more nebulous set of problems: falling copper prices, rising energy costs, a drop in share price, ongoing legal battles and a more volatile social climate in Chile. Social discontent has been building in the country during recent years, in a ripple that began with the movement for free education. Demands have since risen in areas such as healthcare, nationalisation of copper reserves, public transport in Santiago, and in the form of resistance to mining, logging and hydropower projects. These latter small-scale eruptions are more isolated from urban social movements, but they are exerting a certain pressure for reforms. Barrick Gold Corp’s Pascua Lama project was suspended due to concerns over water contamination earlier this year. Since winning the initial election rounds President Michelle Bachelet has stated the Nueva Mayoría coalition’s intention to reform the country’s Water Code. This is highly significant since conflicts relating to hydroelectric and mining projects have led to frequent calls for the law’s repeal. Non-governmental organisations and activists say the current version of the law has the potential to further exacerbate conflicts. The law, which dates back to the Pinochet dictatorship, privatised water management in Chile and gave priority to industrial use of water sources, which are often scarce in Chile, over agricultural use or even over the demand in urban centres. In the town of Los Caimanes, in the Coquimbo region, an emblematic struggle over water resources has entangled Antofagasta for more than a decade. 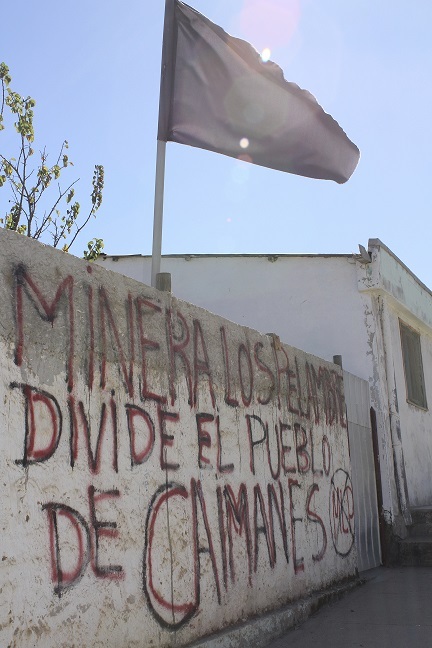 Residents object to the installation of a tailings dam that serves a copper and gold mine belonging to Minera Los Pelambres. Following 16 different legal cases, the community now seems to be making headway. One of the cases relates primarily to water contamination, rejecting reports provided by the company that the water is suitable for consumption. A report by Dr Andrei Tchernitchein from the University of Chile found high levels of toxic metals present in local water supplies. However, the company says this report has never been presented formally in court. Trucks coming from nearby Illapel deliver drinking water to the community weekly, and the legal deadlock continues. Probably the most dramatic turn so far in the Los Caimanes story was an 81-day hunger strike undertaken by 11 community members in 2010. The Court of Appeal of La Serena has rejected claims that the dam was affecting water supply. In January 2013 the decision was upheld by Chile’s Supreme Court. Among this and various other concerns highlighted by Los Caimanes is the seismic risk posed to the tailings dam. This is particularly problematic when you consider that Chile’s long tradition of mining is plagued by the fact that it is the world’s most earthquake-prone country. The tailings dam sits on the tectonic plate where the biggest earthquake ever recorded occurred in 1960. Should the tailings dam collapse, more than 1,500 residents will have an estimated 10 minutes to escape – the risk is latent. The claimants allege that the dam would not resist an earthquake of certain magnitudes and that indications of leaks could threaten its stability. The Court of Appeal of La Serena rejected this claim. The claimants have appealed this decision to the Supreme Court, where a decision is pending. However, a Supreme Court ruling in July 2013 did order the responsible authorities to introduce an early warning system and evacuation plan for the safety of the local population. Los Pelambres has attracted another set of eyes within the international archaeological community. At this year’s conference of the International Federation of Rock Art Organizations held in the US, Chilean archaeoastronomer Patricio Bustamante discussed the excavation project that was involved in the installation of the tailings dam. It was the most expensive excavation in Chilean history. Bustamante has claimed extensive archaeological damage at the site. The museum made to house excavated pieces is still conspicuous by its absence. Antofagasta says it will be ready by early next year. The solutions available to the community are not completely clear. Recent droughts have been disastrous. Los Caimanes’ residents have rejected proposals for development projects for small businesses in the town. This is the link to the original web version of the article: http://www.mpe-magazine.com/reports/community-relations-searching-for-solutions.